My 1st ever post, wants and my collection so far! I have been a huge fan of Pokemon since the very beginning and was collecting everything back in the day ... Unfortunately my mum told me to get rid of all my Pokemon things as I was getting too old for them. Why did I listen to her?!?!? If this is you please contact me ASAP! Anyway, I needs moneys for the upcoming BW5 dragon sets so I will be having commissions for both February and March (what a surprise XD). I will be opening 5 slots for each month, but only slots for February are open right now. If you're interested in getting some cute, awesome pins, click the button below! February's slots are now closed! So yesterday I finally got the chance to buy some Next Destinies booster packs (I bought 7). Thank you 99reddrifloons for the awesome Valentine's Day gifts! I have an (((image heavy))) V-Day photo-story to share with everyone today! It's under the cut! Duckie love pic + more! Beware of using debit/credit cards with Noppin!! So, I just had a major scare today with my bank account. Seems someone got a hold of my debit card info from Japan and charged a hefty sum of money on it. I went to the bank and they told me it was from Noppin. I normally use Noppin for my deputy services and have never had a problem using them, even from way back when they were called Crescent. Turns out the extra charges were from them. Last I used Noppin was about a month and a half ago, and my purchases were already shipped to me. I've had my items for quite sometime, and paid everything I needed to. From my experience, they do not ship until all charges have been paid/cleared. It seems they may either have a security breach, made a mistake and charged me double (And then about 100$ more), or they may actually have some theft going on. I'm letting you guys know, only because many of us use deputy services and I do not want this happening to anyone else. Please be a little on guard, and check your info! Only way I found it, was by checking my account daily.. sometimes more then once a day (I obsess over it at times.. ^^;). Thankfully, I went to the bank this morning and they are fixing the issue. They said it was good to check and that I did the right thing by coming to them immediately. If this post is not allowed, please let me know and I will remove it. I just want to get the word out about it so you can be on guard and not be out money! Added a custom Leafeon and Flareon sculptures, Zoroark/beast trio Shitajiki, and a Zoroark/beast trio mini tin! Hello, it's nice to actually get a LJ and join the pkmncollectors community! I'm pretty much refereed to as Osaka by everyone, so yes.. I've been stalking the site for 2 years, and it's finally time to come out of the shadows. Sooo... my Pokemon collecting started when I was 5 or 6, and I got the 4th movie, because I played smash bros Melee with my brother, and I liked Mewtwo and Pichu, and the 4th movie came with that promo Suicune card, so.... I went overload Collecting the TCG after that, and the Anime of course! Now, I collect really anything that Range from Plushes, Figures, Holo TCGs, Zorua, (Maybe Suicune and Victini in the future!) and anything that looks unique to me. So here we are in February, and still no sign of Jakks Series 4 plushies, I'm tired of going into stores and seeing Munna, Pidove, Woobat, Drilbur, and the entirety of Series 3 minus Zorua. I remember the wait between Series 2 & 3 was a month (at least where I live). This time last year stores were getting in the last DP Series with Zorua, Celebi, Togekiss, Buneary, Pachirisu & Happiny. Target never got that set in, so it went from the series with Teddiursa to the first BW series. Jakks needs to get their act together, seriously. Hm, what's this? A box in the mail too? Looks like Chubs wants to help open it! I've always been a big fan of this holiday, single or not, because I love sweet, love-y things! You don't need a boy/girlfriend to celebrate, in my opinion. You can love far more than just a partner! Parents, siblings, friends, fictional characters, pets, plush!! 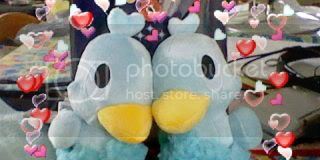 My mom used to get me little plush or candy on Valentine's Day and it always made me so happy. Love is limitless and comes in all shapes and forms. ♥ Plus -- chocolate. Need I say more? Wants!!! Shiny kids and regular kids!!! 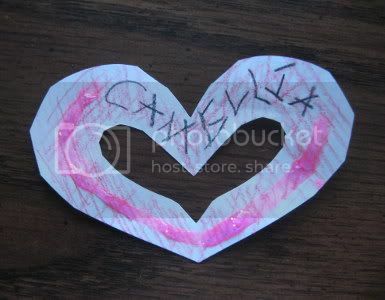 I got my Valentine yesterday from the Exchange, but I've no idea who it's from! Can anyone shed some light? -I have decided that for just now my main collection is going to be of the Canvas plush series, I hope to one day have them all. They are just soo cute that I can't resist them! -I have made my first canvas purchase ... 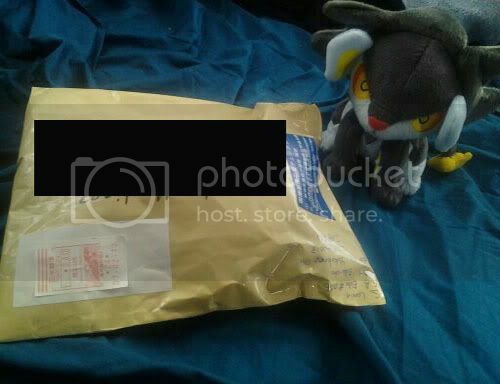 I bought the Growlithe Canvas off of usakochan I also bought 3 McDonalds figures off her as I guess the UK wont get them :( but I am currently waiting to recieve them, I was told earlier that she will be posted them today so I am super excited about that! Secret Grail Get and my last want! An Oddish PlushPlush! I've been looking for this since I first joined this place and was so surprised to actually find one, by chance to boot! It's fabric feels so amazing X3 And the tag is in perfect condition as well! It pretty much completed everything I could have ever wanted... Well except for one thing^^"
So, along with the stuff I posted in my intro, I have a bunch of cards. I thought I'd share some of them. These aren't all of my cards, but they're the highlights of my collection at this time. I'm hoping to expand it soon.